Goddess Saraswati, the wife of Lord Brahma, is the Goddess of learning, wisdom and creativity. Literally, the word Saraswati means 'the flowing one'. Rig Veda accords Saraswati the role of a river deity associated with refinement and success. 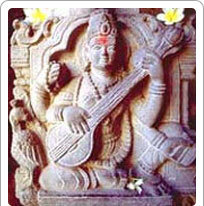 Saraswati is invoked by artists, musicians and writers to bless their creative endeavours as well as by students to grant them success in academics. It is common for parents in India to take their children to receive Goddess Saraswati's blessings before they go to school for the very first time. Saraswati temple of Pushkar is dedicated to her. Sculptures and carvings of peacocks adorn the temple. Peacock is believed to be her vehicle. The temple also has a small image of the milkmaid Gayatri, along with the four faced image of Lord Brahma and is popularly known as Chaumurti. There are silver doors and the temple's gateway is carved marble. Steps in the corner of the temple lead to a small cave dedicated to Lord Shiva.